He’s selling these pocket-sized creations, as well. I love the modular marimba, like a MalletKAT meets a Buchla modular, something I don’t think ever happened in real life, though I could be wrong (and would love to be wrong). Sadly, the papercraft constructions are for aesthetics only; they’re non-functional. 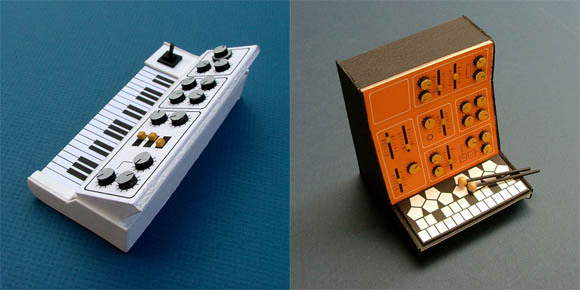 It’d be fantastic to pack a little digital chip and some sensors in there and make these into real instruments. Maybe the electronics wizards here want to suggest themselves to Dan as collaborators? Via our incomparable friend Phillip Torrone at MAKE:Blog.